Building a new home or making outside renovations? We offer soffit and fascia installation and repair in Ottawa and surrounding cities. Request a free estimate today at 613-488-3419. No two jobs are the same — we have teams specialized in new construction and other teams for renovations. 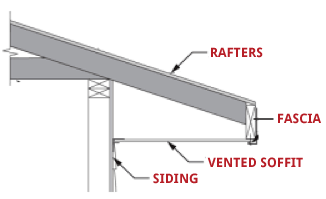 This is an very important distinction because renovating soffit and fascia often implies replacing your homes rafters and fascia due to rotting. Is your home older than 50 years old? If so, it could be time to change the wood fascia. If it’s not looked after, other problems might occur. You do not want your eavestrough to fall down. Soffits play an important role in your home ventilation. Replacing them is more than esthetics; it could help regulate your homes temperature. Maize can colour match any colour available. We recommend calling a professional to install or repair the soffit and fascia on your home. By offering a 25-year warranty on our work and materials, we ensure quality work and service to all of our customers. For soffit and fascia in Ottawa, choose Maize Siding & Eavestroughing!